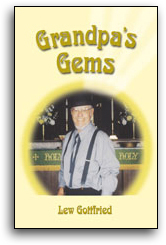 I want to thank you for the extra service you gave to me in putting together my latest book, Grandpa's Gems. This is the fourth book you have published for me. They all have received the same personal attention. I felt like I had a special friend to give me advice and to listen to my suggestions. Thanks to Missy and every one at Fairway Press. 1. Paper size: Use the same size sheet of paper, preferably 8.5 x 11, for every page of your manuscript. 2. One side only: Using only one side of the sheet is the best way to keep the manuscript readable. Double-spacing for the entire manuscript is also preferred. 3. Originals: Never send the original of your manuscript. Make sure that you send a photocopy or a second copy, but never the original. Keep the copy clean and free of ink smudges, food, etc. 4. Page identification: To ensure that the pages of the manuscript are kept in the correct order, number every page. Do not include these numbers as part of your manuscript text. Included in this identification should be any titles, chapter headings, or Roman numerals. 5. Corrections: Any corrections should be marked with a red pen or pencil to ensure that they will be noticed. Please be sure to write your correction notations legibly. 6. Artwork/Photographs: If you are including artwork or photos with your manuscript, follow the instructions on pages 11-13. 7. Disks or CDs: If you have used several different fonts within your manuscript, please provide a separate file with the fonts listed and also a hard copy of such to ensure accuracy. Also enclose a folder containing all the artwork/photographs to be used in the book. This artwork is not to be embedded in the text version of your book. Please include a file containing the name of such artwork/photos and where they are to be placed in the manuscript. Also include a hard copy of this file. Fairway Press does not require a prior query letter from individuals wishing to submit material for review. If you believe your material is of sufficient quality, we invite you to submit it in completed form (no samples, please). Send your material to: Fairway Press, 5450 N. Dixie Hwy., Lima, Ohio 45804 Attn: Sales Representative. We will acknowledge your material and be in touch with you once a decision has been made either to publish or return the material. If you wish to have your manuscript returned in the event it is not accepted for publication, you must enclose a self-addressed envelope with sufficient postage (for bulky submissions, postage alone is sufficient). The publisher will not be responsible for the return of unsolicited material which is not accompanied by return postage. Review of your material can take from four to six weeks. If you do not hear from Fairway Press and wish to have an update on the status of your submission, please prod the sales representative with a card, letter, or phone call. 1. Manuscripts should always be shipped flat, preferably boxed, not folded or rolled. 2. Manuscripts should be sent complete and not in synopsis or installments. 3. Send a good photocopy; never send your original. Address plainly (printed please) and wrap securely. 4. You may send your manuscript by any service you wish, but we recommend sending it either UPS or insured mail. 5. Please include return postage for your manuscript. If there is no return postage, we are not responsible for the return of your manuscript. If we have not heard from you within a six-month period, and you have not provided a return postage envelope, we will destroy your manuscript.